I was treated to a rare sighting near the Buckeye Trail. My rural home is situated adjacent to the Trail. As I left my home on that morning in the pre-dawn moments, I drove down a rural country road along farms fields and wooded areas north of Florida Village and East of Okolona. As my tires purred on the asphalt driving west, the sun was just nearly rising over the eastern horizon at my back. And there in the moments before sunrise, the sound of my approach broke the silence. Suddenly not far ahead of me- as if startled- one ran out of the woods, across the road, and began to dart across a corn field. Moments later- a second one in the same manner as the first. They continued their gallop across the corn stubble, and as I neared the location where I was the closest to them out my side window, I stopped the car. They must have realized I stopped due to the sudden silence once again. In that moment, they also stopped and turned to look back directly at me- likely out of curiosity. I was no further than fifty yards from them. We all stared at each other for a brief time. I marveled at those two Coyotes for a few brief moments as I admired their state of being wild- despite the fact that most farmers regard them as pests. I was awestruck to be treated to such a rare sighting. Although Coyotes are fairly common in Northwest Ohio, sightings are rare because they are mostly nocturnal, and generally avoid humans. After this brief encounter and mutual acknowledgement of each other, I got back in my car and began to drive away, and they continued their run across the corn field heading north away from the trail. Later an acquaintance of mine who is a trapper informed me that late winter and early spring is the mating season for Coyotes. As such, they are active this time of year. I couldn’t help but think how exciting to experience this rare sighting! 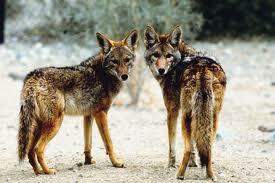 Read more about Coyotes by Clicking Here.